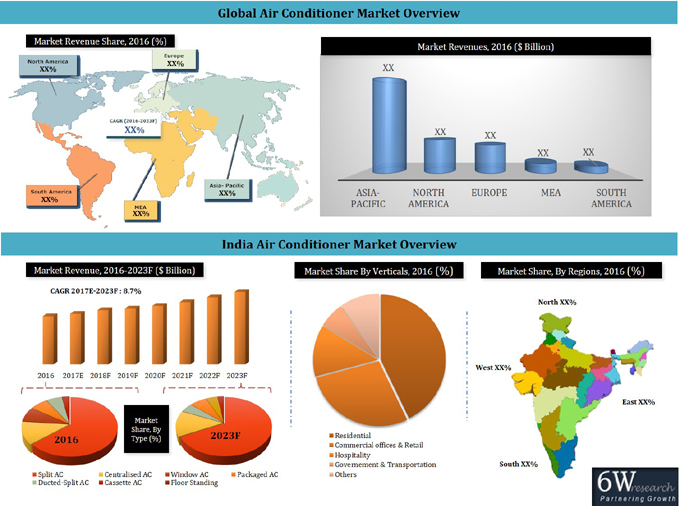 India air conditioner market is buoyed by several factors such as rising disposable income, growing concerns for energy efficiency, surging construction activities, and emergence of mega infrastructure with rising investments in the country. Also, growing retail and hospitality sectors, rising construction activities in the areas of airports, metros, and increasing establishment of SMEs and commercial hubs have fueled the market of air conditioner in India. Moreover, the Government's initiatives such as “Housing for All by 2022” which would lead to higher urban development over the coming years is expected to generate additional demand for air conditioners. According to 6Wresearch, India Air Conditioner Market is projected to grow at a CAGR of 8.7% during 2017-23. India Air Conditioner Market is highly competitive and fragmented, with presence of domestic, international, and unorganized market participants. The market is broadly divided into seven prime product segments; wherein split air conditioner segment held major market share owing to high demand from residential and light commercial applications. Under the centralized air conditioner segment, VRF sub-segment is gaining popularity in the market, registering positive growth year-over-year. In India, the Northern region captured major share in the overall air conditioner market followed by the Southern and Western regions. The report thoroughly covers the market by air conditioner types, by applications, and by regions. The report provides an unbiased and detailed analysis of the on-going trends, opportunities/high growth areas, market drivers, which would help stakeholders to device and align market strategies according to the current and future market dynamics. 13.3 Daikin Airconditioning India Pvt. Ltd.
13.6 LG Electronics India Pvt. Ltd.
13.8 Panasonic India Pvt. Ltd.